This interview was originally made in Portuguese, and translated by the author. On March 15, an estimated one million Brazilians took to the streets in cities across the country to protest unelected president Michel Temer’s proposed retirement reforms which could elevate the retirement age as high as 74 years. Hundreds of union locals held a one day work stoppage and the teachers’ union initiated a national strike. The protest was organized by a coalition of social movements, left political parties and union federations called the Frente Brasil Popular (FBP). The largest organization within the FBP is the Central Ùnica dos Trabalhadores, or CUT, the country’s largest labor union federation and the World’s 5th largest labor body, with nearly 8 million members. Arising out of a series of successful strikes during the late 1970s and early 1980s that started in the industrial ABC region of Greater São Paulo and spread nationwide, it is generally attributed as one of the key factors in bringing down the military dictatorship of 1964-1985. What differentiated CUT from other labor federations of the time was it’s break from the PC do B, the Brazilian communist party, and from dictatorship-recognized unions that were perceived as having a cozy relationship with the corporate sector. Luis Inacio “Lula” da Silva, president of the ABC region metallurgical workers union at the time, had a key role in the strikes and their success led to the formation of the Partido dos Trabalhadores (Workers’ Party or PT). To this day, CUT membership represents the largest group of base level support for the PT party, and many former CUT officials have gone on to careers in politics. Although the ABC region has been partially deindustrialized in the following 34 years, it still represents the core region of union activity in Brazil, and the São Paulo chapter of CUT is the nation’s largest, representing around 2 million union workers. Douglas Izzo grew up in Diadema, a poor industrial suburb in the ABC region. He started his career as a metalurgical worker during the 1980s and participated in a series of strikes. In the 1990s he went to college, got a degree in sociology, started teaching and became a teachers union leader. In 2015 he was elected as president of the São Paulo chapter of CUT. I sat down with him one week before the national protests on March 9 in the São Paulo CUT headquarters to talk about the position of organized labor in the current political environment. Although CUT represents around 8 million workers today, it was nearly twice as large during the 1980s. Why are industrial jobs in decline in Brazil and why has CUT’s membership fallen? The decrease in industrial jobs is a world-wide phenomenon and not something restricted to the Brazilian economy. Important sectors of society became automated. Metallurgical production automated and it takes fewer workers to make an automobile than it did in the 1980s. Around 80 percent of Brazil’s financial sector workers are affiliated with our federation and the bank clerks also suffered a massive decline due to automation. It is also important to emphasize that there has been a process of industrial fragmentation in Brazil and in other countries around the world. Companies flee from cities with strong unions and often receive economic incentives to move to places with low levels of union organization where they can pay workers half of what they would receive in the ABC region. São Paulo used to have a much higher contribution to the GDP from industry than it does today. But it diminished considerably while the commercial and service sectors are growing. Another factor is that when CUT arose in the 1980s there were only two national union federations. Today there are 6 official federations plus another four that aren’t yet recognized by the national labor Ministry. Some American academics and journalists say that the PT party’s policies were the primary factor in the drop in Union membership. In your opinion as the spokesperson of 2 million union members in São Paulo, how were Dilma and Lula’s performances on labor issues? It’s obvious that the Lula and Dilma administrations were unable to resolve all the contentious labor conflicts in Brazil. But it is also incontestable that during the Lula and Dilma administrations we successfully engaged in a struggle to increase our labor rights. In the current context, we are fighting maintain the rights that we achieved during the past 100 years as they are systematically dismantled. So there is a difference and it is brutal. During the period of Lula’s government, the number of strikes decreased somewhat because over 80 percent of our salary campaigns resulted in above-inflation level raises. The monthly minimum wage, which was less than USD 78 when Lula took office, rose to over USD 300 by the time of the coup against Dilma Rousseff. And back in 2002, the unions were fighting to raise the minimum wage to USD 100 a month. So we have to recognize that there were significant advances during this period. In the education sector, where I work we had large increases in the government’s mandatory contribution to the preschool, elementary school and high school systems. The federal government created a national minimum salary for teachers. The national education plan was ratified, mandating that as of 2022, 10 percent of the GDP would be allocated to the public education system using profits from Petrobras’ offshore pre-salt oil reserves. There was a series of important advances for the working class but there were still a lot of strikes and conflicts, as much against the Lula and Dilma governments as against PT-controlled state and municipal offices because our federation values union freedom and autonomy in relation to political parties, governments and religion. So we at CUT do not have any problem confronting governments, regardless of what political party is in control and this is how we behaved during 13 years of Dilma and Lula’s administrations. How many strikes did CUT organize during those years? I can speak for CUT São Paulo, which organizes workers here in this state. There were important strikes against PT Party mayoral administrations. Here in São Paulo City the public workers went on strike against PT mayor Fernando Haddad’s administration and the São Paulo City teachers’ union held three strikes during his four-year term. 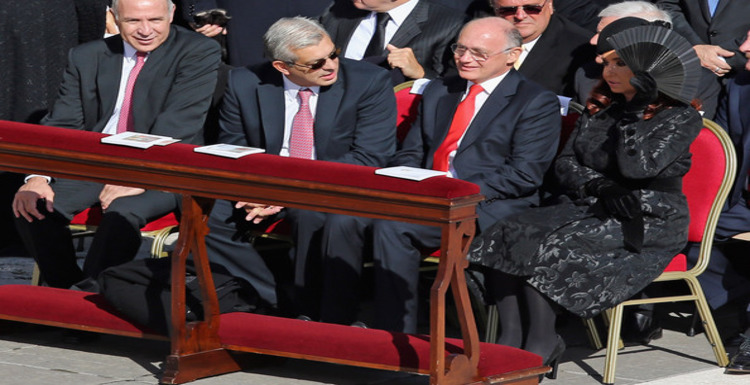 São Bernardo was run by PT Mayor Luis Marinho, who was also a federal minister and CUT’s national president. During his two terms the CUT-affiliated municipal workers’ union went on strike 5 times. We also held municipal workers’ strikes in other important cities in the ABC region that were governed by the PT party such as Santo André and Maua. And we did this naturally because we separate the relationships we have between the political parties, the governments and the union movement. But it is also important to note that during the 13 years of PT governance over 80 percent of the labor force had annual above-inflation salary increases. Another difference between the current coup government and previous governments is the way we are treated. During the Lula and Dilma administrations, the government created spaces for dialogue between the business community, the government and the unions to discuss labor and retirement reforms. So before any proposal was ever sent to Congress there was an ample debate among different sectors of society that no longer exists. Today, the government says it wants to negotiate with the union federations but at the same time that government officials give interviews saying they are negotiating with the unions, the Minister of the Interior goes to Congress and says that if any changes whatsoever are made to pension reform they should reject it. So there is no negotiation whatsoever. How would you respond to the accusations that some people make that the PT party coopted CUT? The answer is that CUT held numerous strikes against federal, state, and city governments run by the PT party. What our political adversaries, mainly on the left, refuse to admit is that during the Lula and Dilma governments the doors were open for conversation. And when the door is open to talk you don’t have to kick it down. Another important point is that there were colleagues who left CUT, saying that it sold out, who haven’t built anything significant. And CUT continues fighting and remains the largest reference of struggle for the Brazilian working class. The Brazilian media narrative, often echoed in the international media, is that Dilma Rousseff committed a crime and was impeached for it through a legal process. What is CUT’s take on last year’s events? The Brazilian constitution stipulates that a mayor, governor or the president can be impeached if he or she commits a crime of “responsibility”. During the Congressional proceedings, the opposition- and this is technical information; released by technocrats in the Federal Senate who conducted the investigation- was unable to prove that President Dilma committed any crime of “responsibility”. If there was no crime of “responsibility”, the judgement was political, not criminal, and therefore constitutes a coup d’etat. The conservatives who conducted the coup used the means of communication to convince society that the country had been inundated in a sea of corruption. But the deposed government never tried to block or slow down any type of corruption investigation by the federal police. In fact, it created mechanisms to eradicate irregularities of the state. The Lula and Dilma governments restructured the federal police and created mechanisms to monitor and accompany all of the public works projects in Brazil. It is important to note that the new government weakened all of these mechanisms and is trying- and this is something that the Brazilian press is underemphasizing- to destroy the Lava Jato investigation. There are leaked phone recordings between high ranking members of Michel Temer’s government in which they talk about the importance of ending the Lava Jato investigation. Eight of Temer’s cabinet ministers resigned over corruption accusations in the last seven months. The latest news from Lava Jato is that Temer’s Chief of Staff, Eliseu Padilha, received bribes and illegal campaign contributions from the Odebrecht construction company. It is important that people realize that there weren’t any allegations against Dilma Rousseff for corruption, illegal financing or bribery. The unelected coup government is supported by the financial system, the business community, FIESP (Federação da Industria do Estado do São Paulo/São Paulo State Industry Federation), the media and the agribusiness caucus and is implementing policies in their interest. It is removing labor rights. The retirement reforms establish that anyone who wants to retire at the age of 65 has to spend 49 years in the workforce. This means unless you start working at 16 and never become unemployed you can no longer retire at 65. This is absurd and represents an attempt to destroy the public retirement system. The congressman in charge of the retirement reforms is financed by Safra, Bradesco and Itaú banks and this reform will end up forcing a lot of workers to purchase private retirement plans from those institutions. No candidate has ever run for the presidency promising to raise the retirement age, end formal employment protection and greatly expand outsourcing. Nobody would ever get elected saying these things. The only way to remove the labor rights that we fought for over the last 100 years was through a coup and they managed to destroy a lot during their first few months in office. What is the strategy that CUT is using to fight the coup? CUT organized several national protests during the past two years. Yesterday on International Women’s Day, for example, we organized a march of over 50,000 women on Paulista Avenue to protest the retirement reforms. It may be that our colleagues in other countries didn’t hear about this because there is a communication monopoly in Brazil. Five families decide what content the Brazilian public will see and what information will reach the international news, so maybe our foreign colleagues and even a lot of Brazilians don’t know it happened. When unions protest to defend workers’ rights, the media doesn’t direct one sentence to it. 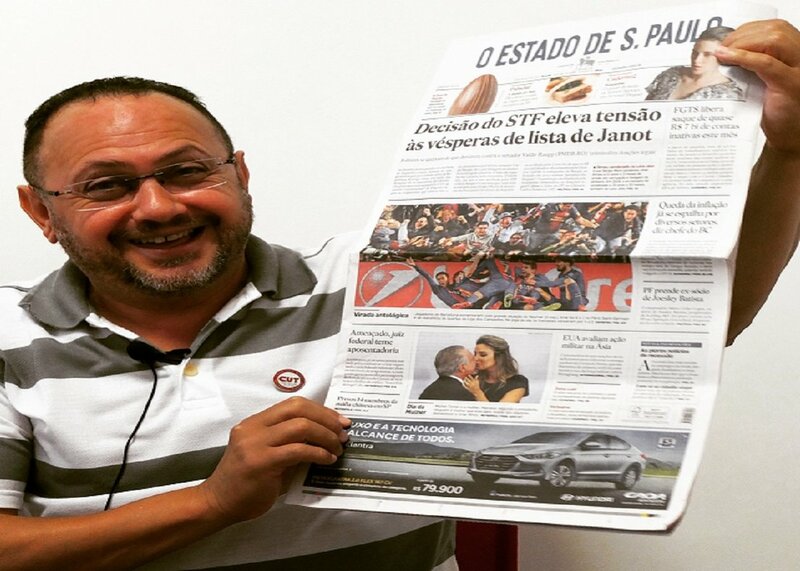 I have today’s paper right here- it’s Estado do São Paulo, one of the nation’s largest. [He holds up the newspaper] We held a large protest yesterday and you can observe what they are talking about today. The headline is this suspicious football match between Barcelona and PSG (laughs). Here’s another story about a recent supreme court decision. And here is Michel Temer kissing his wife on International Women’s Day in Brasilia but there isn’t one line about 50,000 women paralyzing downtown São Paulo. And this was a nation-wide protest that took place in every state in the country. This media partiality could lead people outside Brazil to believe that there is no resistance, but we have organized a lot of protests: our May Day protest, our occupation of Praça do Sé, our participation in the Gay Pride Parade. Look at this photo of our protest that put half a million people on Paulista Avenue– look at the size of the crowd in this photo. The media tried to say that it was only 70,000, which is absurd. When the conservatives held their protests the media referred to crowds of 20,000 as 100,000. It called a crowd of 100,000, 1 million– there was this entire process of manipulation. On March 15, we will have a national day of work stoppage and the teachers unions, which are the largest segment in CUT, will start a national strike. Our calendar is full of confrontation and paralyzation, putting pressure on congressmen and the government. I think it is important to emphasize to our friends outside of Brazil that before the 2014 campaign financial reforms it was even easier for large economic groups to elect their representatives to congress and this created distortion. The big businesses, the bankers and the agribusiness lobby have their own congressional caucuses. Therefore, congress is not likely to vote in favor of proposals that represent advances for the poor. Since 2013 we have seen a series of popular protests mischaracterized by the media. The media hijacks the protests and rebrands them for its own purposes– not just the traditional media but forces in the social media as well, like the Movimento Brasil Livre which receives support from the Koch brothers. What good does it do to put 500,000 people on the streets if memes are spammed across Facebook saying that a crowd of 10,000 homeless people marched for free bologna sandwiches? Don’t you think that there should be some other tactics beyond street protests to fight the coup government? We sponsor debates in city councils, churches, neighborhood associations and all the sites where doors are open to us across the country. We hold these debates to show the dangers of government reforms underway in the National Congress. A second strategy is to build and strengthen alternative media. With our nearly eight million workers nationwide, we have a huge potential to spread news. Our big challenge is to unite our news activities as the right does. If you look at all the big newspapers, they have the same editorial line and the same top stories. If you look at the left media, each one wants to build its own narrative. This does not always contribute to a unified narrative on the Brazilian context. So we have some experiments now, like Radio Brasil Atual and the TVT Cable TV station, which is the worker’s TV station in the ABC region, but they are relatively tiny players in the Brazilian news universe. I think that the alternative media has an important role, Media Ninja and Jornalistas Livres for example, and we try to work together with them to strengthen our narrative and transmit it to society because in Brazil, unlike what you might have in the U.S., there is no such thing as a left or right wing press that offer differing opinions. It’s one single narrative, a single editorial position. It is a single voice that greatly influences the Brazilian population to think, for example, that the people who attend one of our protests, taking place on a weekday, are unemployed. It’s a deliberate mischaracterization. Because when a protest serves the interests of the media, “My God, look how beautiful it is. The giant’s awakened. How marvelous. It’s democracy in action”, and so on. And when it doesn’t interest them it appears on TV as, “protesters block traffic.” It’s an issue the Lula and Dilma governments could have done something about but didn’t, so we are still stuck with this communication monopoly in the hands of five families who collectively decide what news the people are going to see every day. Do you believe that there were any foreign interests behind last year’s coup? We believe that there is North American interventionism in Latin America. It is very clear for us that the old North American strategy to use tanks and bombs has shifted to a more subtle strategy of propaganda, buying political agents and using the means of communication to build movements to destabilize governments using the same narrative everywhere– associating the governments with a sea of corruption. We’ve seen this happen around the world. This is what happened in Paraguay. This is what happened in Honduras with the Zelaya government. This is what is happening in Venezuela and it’s what happened in the Arab Spring when various governments that were against North American interests were deposed. It is important to emphasize the foreign interest in the pre-salt oil reserves behind all of this interference. Until recently, the petroleum reserves were considered a path to the future for the Brazilian people but we see the leaked state department cables that show Senator and former coup government Foreign Minister José Serra had secret meetings about privatizing the pre-salt with American petroleum corporations. We believe they helped finance the coup and that they financed destabilization, created agitation through the means of communication and the social networks and built a narrative that manipulated one part of society to impose a de facto coup against a democratically elected government. This strategy is very clear to us because the same people who were defending ethics and transparency 6 months ago are now trying to bury the Lava Jato investigation. This government didn’t take power to try to solve Brazil’s problems. It took power to guarantee the interests of the North Americans– of North American imperialism and capital and elite interests here in Brazil. Additional editorial support provided by Aline Piva Head of the Brazil Unit, and Mitch Rogers, Kate Terán and Alex Rawley, Research Associates at the Council on Hemispheric Affairs.